Description of "Be Heard Now (eBook)"
Do you want to connect easily and with genuine depth with people around you? Do you dream of having clear and positive interactions rather than awkward conversations with confusing outcomes? Then this book will change your life, because it’s written for you. With its highly practical and easy-to-follow system, "Be Heard Now" shows you the five simple steps you can use right now to change the way you communicate. • It will help you establish deep connections with everyone you meet. • It will show you the mistakes most people make, and how you can avoid them. • And more than anything, it will destroy the idea that clear and strong communication is a hard skill to learn. Follow the five steps in this book and you will see immediate change in how people see and hear you; misunderstandings will be a thing of the past; and when you connect, you will connect from your deepest self. What’s stopping you from being the open, relaxed and honest communicator that you know you can be? Why should you follow a former monk and noise musician, an ex-socialist riding a fat Harley Davidson, who enters boardrooms wearing jeans and cowboy boots and a long, black coat? You shouldn’t. Unless you want to have your ideas about communication, coaching and leadership taken apart and rearranged into a way that might seem strange, but you realize make perfect sense. I have travelled the world with a spiritual perspective and a business perspective, and has used this unique combination in the boardrooms of some of Norway’s largest and most successful companies. I coached companies to increase revenue by $12 million in only 1 short year, CEOs to change the way they speak with employees and reducing staff turnover. But more importantly, I now teach people to become coaches using my unique coaching system, Leadership by Heart. With its 5 Essential Steps to create genuine and deep connections, transform problems into resources, find your true path, and turn your dreams into reality. 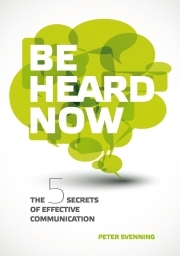 Reviews of "Be Heard Now (eBook)"